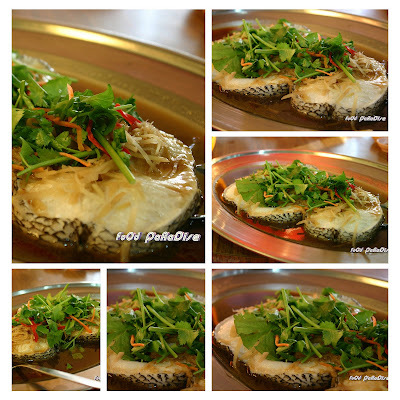 Since it is still Chinese New Year right now, I decided to post some of the foods that I have review for this Chinese New Year. This year, we decided to spent our "reunion dinner" in a newly open restaurant in Sungai Petani. The restaurant just open barely for few months. My brother in law suggested that we had dinner at this restaurant as he savours their foods before and recommended we have a try. 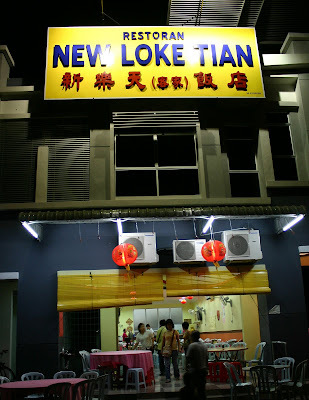 It is located in a new shop lots before Bandar Laguna Merbok, Sungai Petani. If you exit from Sungai Petani Utara toll, go straight and passed through two traffic light and make a U turn. The restaurant is just 150m away in your left. My sister in law changed the braised pork trotter to braised lean pork as most of my in law family members does not consume fatty meats. ^-^ So this one suits them. As it is all lean pork. But I found that the lean pork is a bit tough. 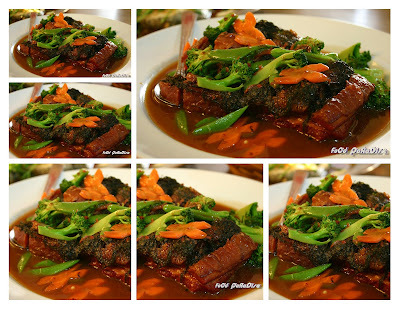 I like the tender type of braised pork. ^-^ The sauces are ok and not too salty. When this plate of chicken arrived, I think each of us thinking of how to finished this whole chicken? The Chinese herbs are not that strong so the kids are willing to have some of it. And the chicken are tender. Well, I enjoyed this dish very much. And we finished all the pumpkin. The sauces go well with the pumpkin. 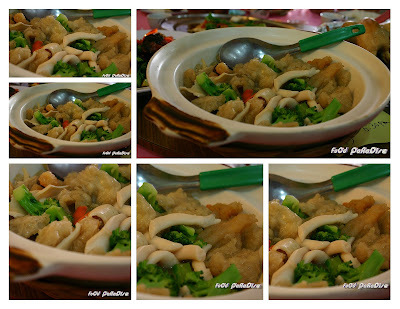 Kids enjoyed the assorted vegetables with fish meat. 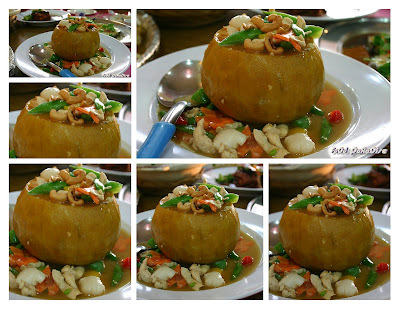 I would recommend that you have a try of this dish if you like pumpkin. Stir fry vegetable was the first dish that the family members finished. 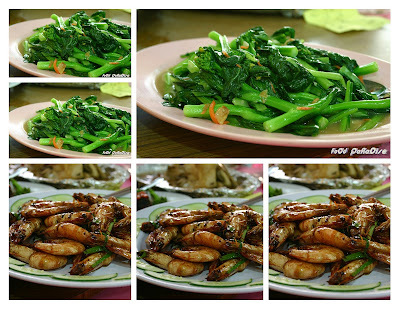 As that is the only greens beside the steam assorted vegetables with fish meat in pumpkin bowl. ^-^ I think everyone are scared of meats after the lunch that prepared by my MIL for prayers. Next, came the prawn. This is one of the dishes that was finished by the family members. As there are quite number of prawn lovers like me in the family. ^-^ Prawn are nothing special to highlight about it. The cooking style is quite normal. This is the special desserts only available for our table. As since they don't like the desserts the restaurant offer in the package, we make some changes with the boss. Then the boss came out with this desserts. Out of surprise their desserts are nice as not too "Sweet" which we usually get from other restaurants. First of all, I would like to apologize to my readers of FoOd PaRaDiSe as I have been very busy lately as since CNY is around the corner and I am busy with the cleaning, baking and also busy helping friends with hamper. With all the things to do on hand, I have no chance to sit down and check my emails and also do any blog hopping. 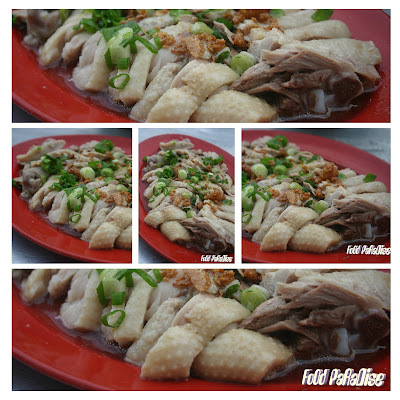 After searching from my draft folder and I saw this Koay Teow Thn'g and decided to share with my readers. I have been to this stall for many years but did not really blog about this place until my last visit there. Sometime I tend to forgot to blog about the place that I often visited. As I always thought that I have blog about the place. This place is very easy to locate. This stall is situated in a service road of Lebuh Kimberley, just before Bee Chin Heong. You will never missed the place as normally there will be full of people. Usually we went there quite early to have our breakfast there during weekend as it would be easy to get a car park. Normally we will park our car in the service road. What do you expect to get from this stall? 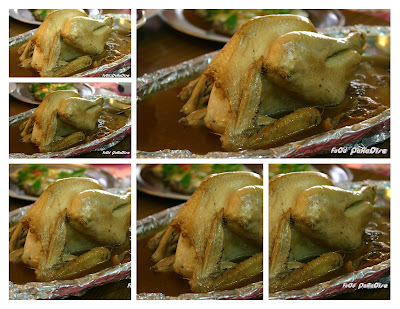 Well, apart from KTT, Koay Tiaw Mee, Bee Hoon Thn'g, you can also order a plate of duck meats, braise chicken feet, blanched vegetables with oyster sauce and you can also order some of the specialty (such as duck drumstick and other duck specialties) which you have to enquire with them. The duck meat that you get here is very tender and if you cannot take the duck meat smell, I recommend that you have a try this duck meat. As you will be thinking that you are having some chicken instead. If you like tender braised chicken feet then you could give this place a try. 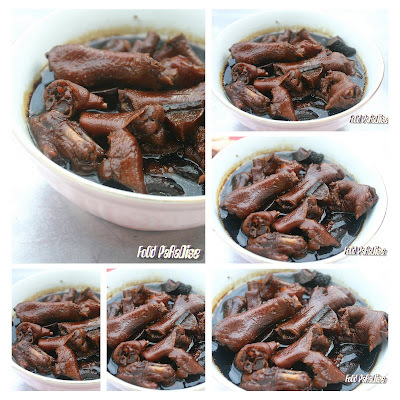 Which I found that the chicken feet cook to a perfect timing. As you can see from the photos that the chicken feet still look firm rather than lumpy. But when you put into your mouth, you will feel the tenderness. So does the mushrooms. 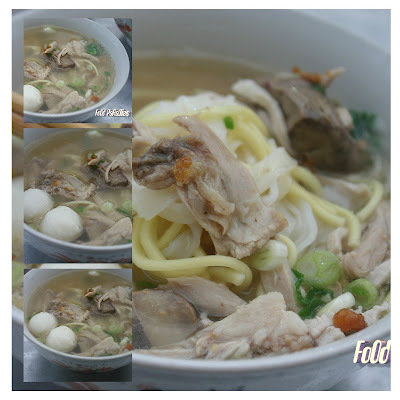 For me, with one bowl of bee hoon thn'g I am already satisfied since the broth are full of aroma. I think I don't have to describe any more. As you can see that from your eyes. And my gal likes the fish ball in this stall as well. 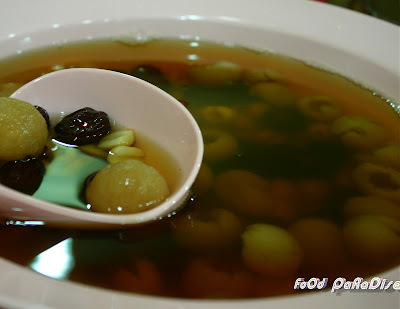 Oh yes, you can also order a bowl of fish ball too if you like springy and not salty fish ball very much. 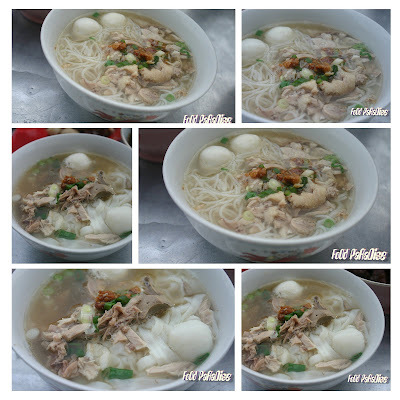 Hubby and my sis in law will normally order koay tiaw mee thn'g as they like the combination very much. You can see my review back in 2007, here.